I'm so pleased the same lenses work out well for both sport photography and night sky photography, because those are the two kinds of photography I like to do. Recently, I was able to double dip a rental from BorrowLenses.com. I had been thinking about borrowing a lens for a while, but I didn't like the idea of possibly booking something and having overcast skies. Side note: Use this referral link to get $20 off at BorrowLenses.com when you spend $99+ and I'll also earn $20 off my next rental, it's a win-win! I finally pulled the trigger when I had the opportunity to do some basketball photography to help out Campus Recreation with their intramural championships - so I had a specific date and time that my lens would be needed, and then I would just hope for clear skies sometime within that same week. I went with the Canon 70-200 f/2.8 without image stabilization (to save a buck), I got the protection plan and it came to about $100 after shipping. My lens arrived right on schedule and was in a sturdy box. I learned I was supposed to send it back in the same box at the end of the week, and it came with a UPS shipping label inside for the return trip. Get $20 off at BorrowLenses.com with this referral link if you spend $99+ and I'll also get $20 off my next rental :) k thanks now back to the blog post! This lens took a little getting used to - first of all, the casing is a fixed dimension so all the zooming happens inside the structure. Okay I probably could have described that better. There's no big long thing that comes out when you zoom in, it stays the same size. The lens was so heavy duty it came with a tripod collar to mount it over the center of gravity. I had to look up the 1.5m to infinity and 3m to infinity switch on the lens. It helps you focus faster if you tell the lens that you never expect your subject to be closer than 3 meters. When I was doing indoor sport photography, at first I wasn't all that impressed. My LCD preview looked okay, and I still had to crank the ISO up to 800-1600 range to get a fast enough shot. This seemed slightly annoying since I paid $100 just to have a faster lens. Then when I compared the photos to my pics from last year, there was no comparison. It was CLEARLY better, and I must have remembered incorrectly because my photos from last year had tons of grain and maxed out ISO at 6400 and even 12800. So I took 1700 photos and ended up with 200 or so pretty cool shots, and maybe 10 'wow' shots. It's my annual sport photography crash course haha, but it's fun. The students love feeling like all-stars and I think they set the pics as their Facebook profile photos for a while. 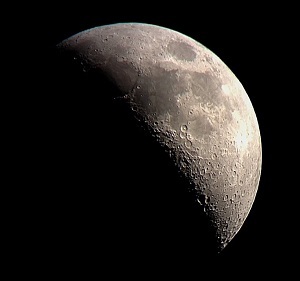 Okay, let's go from the indoor basketball arena to the night sky - can the Canon 70-200mm f/2.8 do both? In short, yes. 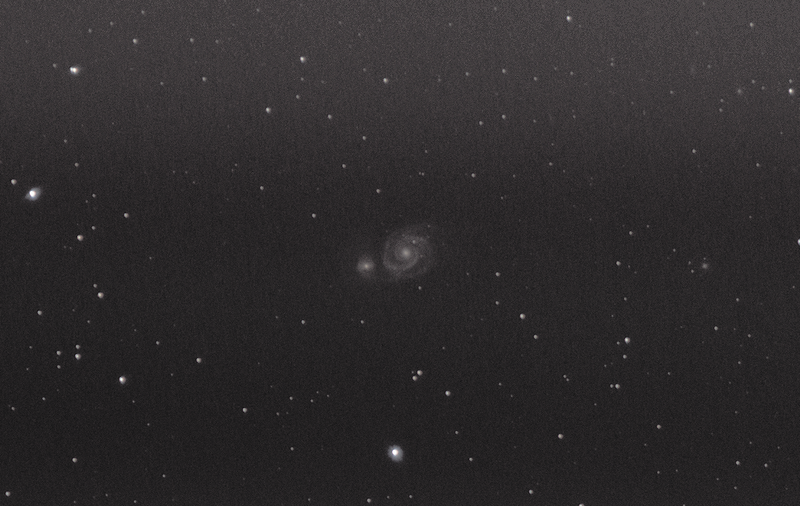 It took a while to find a target, but after seeing the Whirlpool Galaxy (M51) at 200mm, I realized it was large enough to actually see and would be a fun deep sky object to try, although I'd never imaged it before. It was very easy to locate, to the right of famous double star Mizar and Alcor in the handle of the Big Dipper rising in the east. Like I said, not much else was up this time of the year within reach of my lens. Quick side note here about flat frames, this lens produced a really weird gradient pattern that was horizontal bars instead of a circular hot spot in the center. Is that weird? Flat frame from 70-200 f/2.8 lens looks weird. 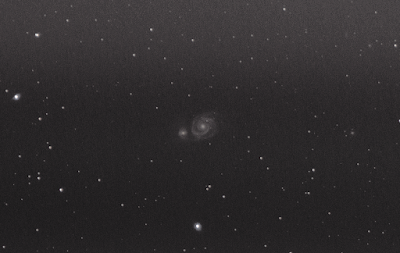 Also, see the image above, Deep Sky Stacker didn't really remove the gradient bars even with these flats, so what gives?